What Are The Best Online Associate in Communications Programs? What Else Can I Expect From an Online Associate in Communications Program? What Can I Do With an Associate in Communications Degree? By earning an online associate degree in communications, students not only develop clear and effective writing and speaking skills, they also learn to apply these skills to careers in broadcasting, journalism, marketing, and public relations. To enhance their job opportunities, many associate students go on to pursue their bachelor's or even master's degrees. Some, however, immediately enter into the workforce as broadcast technicians, PR assistants, proofreaders, and technical writers. The U.S. Bureau of Labor Statistics projects strong growth in the communications field, including an 11% uptick in jobs for technical writers between 2016 and 2026. Whatever your academic and professional goals, an online associate degree in communications can propel you in the right direction. Colorado Christian University’s online associate of arts in communication studies program prepares students for career advancement and the completion of a bachelor’s degree in communications. The 60-credit degree helps learners enhance interpersonal communication, critical thinking, and public speaking skills through its focus on communication theory and application. The curriculum also integrates biblical principles to connect course concepts to the Christian faith. Learners can graduate in two years or fewer. The program can be accelerated by transferring up to 45 credits from another college or university. Students complete courses one at a time in five-week blocks. Northampton Community College offers a variety of associate degrees, many of which learners can take online with little to no in-person participation at the campus in Bethlehem, Pennsylvania. Through the 62-credit associate in applied arts in communication studies program, students complete general education courses necessary for four-year degree programs while studying the fundamentals of communications theory and practice. Learners take courses in English, science, and mathematics, along with communication-focused courses like sociology, intercultural and interpersonal communication, and public speaking. Students may specialize their degree to their field of interest through electives covering topics in mass communications, media production, business, and the performing arts. Most learners can graduate in two years when attending full time. Nassau Community College is a part of the State University of New York system and offers more than 70 fields of study through in-person, online, and hybrid learning models. 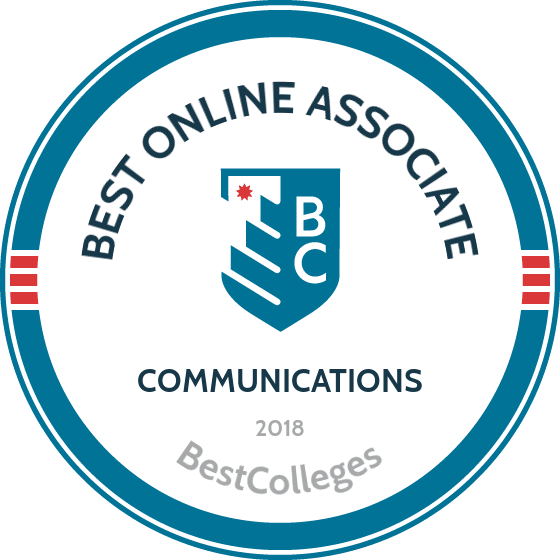 The college’s online associate of arts in communication arts degree offers a solid foundation of communication processes, content, and media to prepare individuals for job placement or a four-year degree. Students must complete 66 credits of general education and communication-specific courses. Communications electives include small group communication, voice and diction, and intercultural communications. This program follows a hybrid learning model, with 50% of the courses available online and the rest in-person at the Garden City, New York, campus. Santa Rosa Junior College has designed its associate degree curricula to prepare students for admission into California State University’s four-year degree programs. The school’s 60-unit associate in arts for transfer in communication studies degree requires learners to complete a mix of general education courses and electives, along with 18 units of communications studies courses. SRJC’s communication studies classes help students build a foundation in speech, develop critical thinking skills, and understand the field of communications through both theory and practical experience. Courses cover topics like interpersonal communication, argumentation, and mass communication. The SRJC associate degree in communications is a hybrid degree, and at least 50% of the courses required are available online. Students need to complete the remaining courses in person. Once they have completed their associate degree, learners will receive automatic admission with junior standing to a CSU school. Sinclair Community College, located in Dayton, Ohio, offers more than 240 degree and certificate programs. Students may take courses both in person (at one of the school’s five campuses) or online. The school’s associate of arts in communication studies program develops students’ ability to comprehend and apply communication theories to effectively deliver messaging in a variety of settings. Students may personalize the program to help meet their educational and career goals and interests. Learners must complete 62 credits. These include general education courses, electives, and communications-centric courses. Additionally, students must complete an in-person communications capstone, where they develop a communication portfolio to demonstrate their understanding of program concepts. South Texas College focuses its online associate of arts in communication with a speech concentration program on the fundamentals of interpersonal interaction, group communication, argument and debate, and public speaking. Students graduate with a strong foundation of communication theory and speaking skills. Learners must complete 60 credits, including 42 credits from the STC core curriculum and 18 from the communications field of study. The speech concentration in the program also requires a three-credit introduction to speech communication course. Most students can complete the program within two years. Lone Star College is one of the fastest-growing community colleges in the nation, with six campuses near The Woodlands, Texas. Thanks to its easy credit transfer system, the school’s associate of arts in speech communication program leads students to the completion of a bachelor of arts in speech communication at a four-year college or university in Texas. Learners must complete 60 credits of general education and communications courses, including electives such as voice and diction, oral interpretation, and professional communication. Through the Lone Star College System, distance learners have access to the school’s Virtual Learning Assistance Center, which provides online advising, library resources, and technical support. SUNY Broome Community College, located in Binghamton, New York, offers a variety of associate degree and certificate programs. The 62-credit associate of science in visual communication arts degree delivers to students the conceptual and technical skills behind image-based communication. These skills prepare graduates for careers in fields such as animation, graphic design, art education, fine arts, and photography. Students complete general education courses, and courses covering art-related topics like 2D and 3D design, computer graphics, effective speaking, acting, art history, and mass media. Learners may complete the program in two years by taking classes through Blackboard, the school’s online learning management system. Students also have access to numerous academic services, including an online writing center, tutoring services, and academic advising. Genessee Community College’s associate of science in communications and media arts program helps students build skills in production, writing, mass media, and communication technology. The 62-credit program enables distance learners to take classes such as introduction to black and white photography, introduction to broadcasting, TV and video production, and media writing. Additionally, students have the opportunity to work directly with radio stations, a photographic darkroom, and a television production studio at the school’s campus in Batavia, New York. Student typically complete the hybrid program in two years, and may complete the majority (75%) of the courses online. However, they must visit campus in person to complete the remaining classes. Allan Hancock College’s associate of arts in speech communication program allows learners to achieve an associate of arts for transfer degree or an associate of arts degree. The former is better suited for those who plan to transfer to a four-year college or university. In both programs, students study communication theories and develop oral and written communication and research analysis skills. Courses cover public speaking, interpersonal communication, and argumentation and debate. The AAT degree requires students to take 18 units of communications-related courses, while the AA degree involves an additional three units in communications studies. Certain courses require no in-person participation, and students must complete the remainder on campus in Santa Maria, California. Academic programs at the associate level cover the fundamental topics and skills needed to land many entry-level positions in the field. However, other curricular and professional development components vary based on the orientation of the department and faculty expertise. Beyond certain required topics, advanced classes differ depending on specific program goals. You may find that one program offers electives and another requires an internship or a capstone experience. Research thoroughly and ask questions of admission counselors to identify the school that best aligns with your interests, career plans, and schedule. The list below details five sample courses that are commonly found in online associate degree in communications programs. Information Literacy: As information becomes more readily available, using it effectively and ethically is more and more important. This course teaches students how to gather, interpret, and synthesize information and analyze its effects on our politics and culture. Communication Theory: In this course, students explore interpersonal communication theories, including ideas of "self" and the effect of communication on public consciousness. The class also explores relationship building, diversity, and theoretical applications. Critical Thinking and Argumentation: In this class, students learn to apply communication theory to problem solving and persuasive reasoning. Programs typically emphasize either oral communication or written communication -- the latter is geared toward analysis, presentation, and rebuttal. Mass Communication: This course takes students through the history of media, such as the press, television, film, and the internet. Students also learn the fundamentals of media theory, its applications in advertising and public relations, and related ethical challenges. Research Writing: An integral communication course for all professionals, this course teaches students how to conduct academic and professional research using reputable sources. Students then synthesize that information in written form. Additional topics include publication, editing, peer review, and research funding. How Long Does it Take to get an Online Associate in Communications? Online associate degrees in communications usually take two years to complete, requiring at least 60 credits. Beyond these requirements, specific program structures may affect how long it takes to earn your degree. Instructors typically deliver coursework asynchronously, and most programs enable you to take as many or as few courses as you like each semester through individually paced learning. Some programs, however, offer or require cohort learning, where you progress through classes with the same small group of peers -- sometimes taking one class at a time. This model emphasizes collaboration and benefits distance learners who want to maintain a full-time job, but it usually takes more time. Internship and capstone requirements also affect the graduation date. Some schools, especially community colleges, offer baccalaureate pathways that let you transition into a four-year program after completing general education and prerequisite coursework. If you hope to expedite the time it takes to earn a degree, look for online associate degree in communications programs that provide accelerated classes year-round, including summer sessions. For colleges and universities to confer valid degrees, they must obtain and maintain accreditation at either the national or regional levels. Organizations with authority from the U.S. Department of Education (ED) and the Council for Higher Education Accreditation (CHEA) grant national accreditation, which reflects a school's adherence to governmental academic standards as well as those defined by CHEA. In return, the school's enjoy the support and resources of both organizations, including federal funding through the ED. Schools receive regional accreditation from the regional accreditor for their section of the country. Overseen by CHEA, these institutions ensure that colleges and universities adhere with their standards. Employers tend to value regional accreditation more highly because they work with local and state authorities more often. Online associate degree in communications programs also earn the backing of professional organizations like the Accrediting Council on Education in Journalism and Mass Communications. As a government body, the ED ensures that schools work with the federal government to maximize pedagogical and testing outcomes. Without regional or national accreditation, schools lack access to government financial aid and other crucial resources. For more information, visit the ED's and CHEA's websites. Obtaining an online associate degree in communications enables you to pursue careers in writing, journalism, and subfields related to business and the media. Communication specialists display time- and detail-oriented characteristics. They also possess exceptional critical thinking, problem-solving, and interpersonal skills. The list below details five popular communication careers. Technical writers create articles, manuals, and how-to guides focused on complex business and technical topics. They work as freelancers or for businesses collecting and disseminating information. Though many enter the field with an associate degree, other technical writers hold a bachelor's and specialize in a particular industry, such as computer networking or industrial production. These communication professionals work for television channels/shows, film companies, or at a particular venue like a recording studio or stadium. They help create media products through various tasks, from drafting and proofreading to operating lighting and sound equipment. You can become a broadcast technician with an associate degree in communications and learn more advanced skills on the job. Public relations specialists cultivate and maintain a favorable public image for their client, creating campaigns to increase awareness of a company's services or products. They also work for individuals such as celebrities and politicians. Most PR specialists hold a bachelor's degree or higher. These communicators work in advertising and promotions, generating public or private buyer interest for a business or organization. They lead teams through the process of creating, implementing, and evaluating social media campaigns and other marketing projects. As one of the top professionals in their field, marketing directors must earn at least a baccalaureate degree (and usually a master's) and possess years of experience. These professionals maintain the interpersonal functions of an organization, serving as the link between the company and its employees. They recruit and train staff, develop business plans, and handle HR issues like sexual harassment cases or an employee's benefit plan. While you can work certain jobs with an associate degree in communication, the majority of related careers require at least a bachelor's. Obtaining baccalaureate credentials not only widens your potential opportunities, but also enables you to advance beyond entry-level positions and earn a higher salary. For example, marketing professionals who start out as marketing coordinators can become specialists, improving their pay by more than $5,000 per year. Bachelor of Arts/Science in Mass Communications: Drawing on core topics from associate programs, this bachelor's degree teaches students to apply communication theories to a variety of media, such as broadcasting, print journalism, and advertising. Students usually select a specialization. Bachelor of Business Administration in Marketing: This concentrated BBA provides students with training in advanced topics like pricing theory, buyer behavior, and importing/exporting. Students also develop leadership skills that empower them to manage teams and create effective marketing campaigns. Bachelor of Arts in Journalism: In addition to cultivating research, writing, editing, and digital communication skills, journalism students study the ethics and laws at work in the field, including their First Amendment rights. Bachelor of Arts/Science in Human Resource Management: This bachelor's tackles advanced topics like recruiting, training, and employee incentivization. Students learn to develop organizational strategies and conduct research that identifies and resolves complex HR challenges at the management level. Bachelor of Arts/Science in Digital Media: This degree teaches students to create virtual communication products using visual, audio, and written design elements. Digital media emphasizes computer skills, and students complete coursework in Adobe, Apple, and other design software. Most communication careers require at least a bachelor's, though some -- such as copywriting, editing, and broadcast production -- allow entrance at the entry level with an associate degree. However, additional academic training and certification typically leads to higher salaries. The table below details five careers and their pay ranges over a professional's lifetime. Networking and project funding serve as crucial tools for the success of professionals in any field. Associate degree in communications students should consider joining an organization that provides its members with these kinds of resources. Though most memberships come with an annual fee, the pay-off can be invaluable. In addition to research, award, conference, and leadership opportunities, some professional organizations also offer a wealth of professional development services such as skill-specific webinars facilitated by the Public Relations Society of America. Accrediting Council on Education in Journalism and Mass Communications: With more than 113 partner institutions, the ACEJMC serves as the primary professional accreditation organization in communications. Members enjoy social opportunities and access to the council's enormous library of research and strategic plans. Association of Marketing and Communication Professionals: Founded in 1995, the AMCP recognizes and supports excellence in marketing and communication. The association also provides members with access to work opportunities through its business partners. National Communication Association: Dedicated to advancing the field through research, inquiry, and public advocacy, the NCA also holds conferences and provides students with opportunities to join honor societies and engage in academic discourse and research. Public Relations Society of America: The PRSA is the largest community of public relations and communication professionals in the U.S. Members can access benefits such as research sponsorship and scholarships, professional development training, and a resource library. The Association for Women in Communications: With a mission to empower female communication professionals, the AWC boasts over 1,100 members and offers up-to-date research, conferencing, networking events, financial support, and a job board. When researching prospective online associate degree in communications programs, look at both the price and funding and consider how a program matches your personal interests and future goals. Doing the proper financial legwork enables you to greatly minimize student loan debts, and you might even end up earning a degree that costs you nothing. The Free Application for Financial Student Aid (FAFSA) provides a convenient way to sign up for multiple scholarships and grants at the same time. You should also look into awards offered by community programs and private organizations like ACES: The Society of Editing.